Labor Day is usually the time we start thinking about summer's end, but given how hot it's been this month, I'd say there's still plenty of summer to go around. Of course, we are looking forward to this 3 day weekend that will be filled with food, family, and fun. I have a jam packed schedule that includes tailgating and watching the first Notre Dame home football game, a demolition derby, and 2 cookouts. I thought that with all of the heavy foods that will be consumed this weekend, it would probably be best to go light on the desserts. 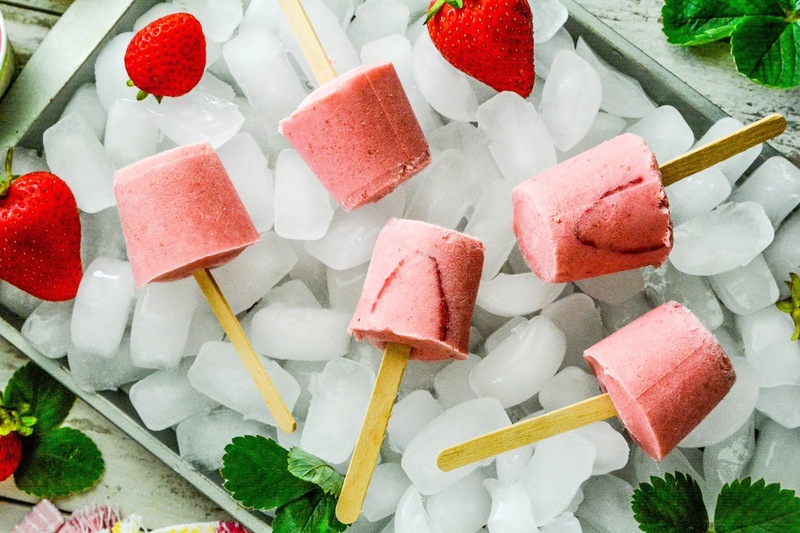 Instead of a rich cake or sweet pie, I am making these Lo-Cal, Low-Fat Strawberry Freeze Pops found on Golden Blossom Honey. 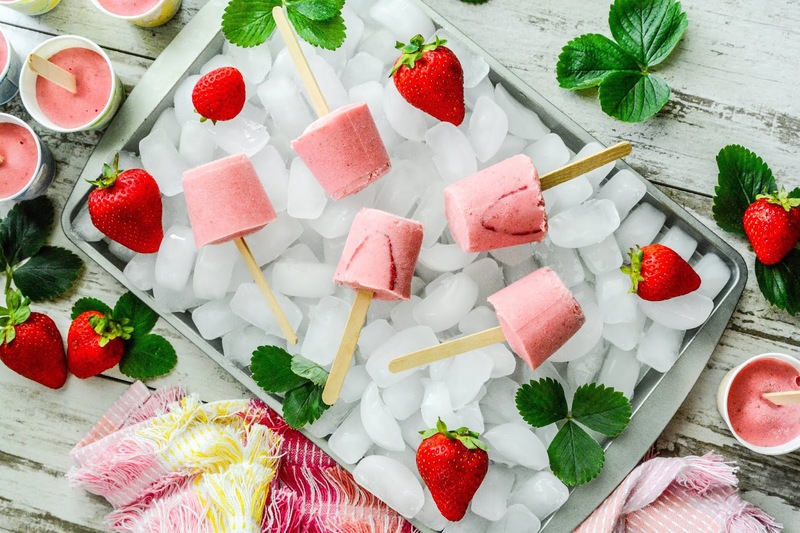 Made with 3 simple ingredients you probably already have on hand, these are an easy and delicious summertime treat. When I first tried them, I thought they tasted just like those organic Johnny Pops you find at the supermarket that are crazy expensive (like 4 pops for $5). Now, I can make them myself at home for a fraction of the cost! You could leave the recipe as is, or for a little surprise inside, put a few sliced strawberries into the mixture before freezing. If you don't have ice pop molds, just use some paper cups. I was able to get about 15 paper cups filled from this recipe. And, it's the perfect size for your little cookout guests, so even in the sweltering heat, they'll be gobbled up before melting. We don't have Labour Day, but the school starts Monday, so I'm guessing this will be a sad weekend for most of kids here. I have drawers full of the molds. The recipe said to fill into paper cups, so I try to stick with what they have listed in the recipe to match the photo. I do like the size of the paper cups though. Most of our kids went back, but I think many on the east coast don't go back next week, so I am sure we'll have a few sad kids over there too. This looks delicious!! Living in Florida, it is hot, basically, all the time, so I’m always looking for a cool treat! And I love strawberries!!! Your blog is so colorful, I love it! I am in school, so I’ll be mostly studying over the Labor Day weekend. But, I'm almost finished, not much longer now! Hope you have a great one!! Thanks for stopping by Rebecca, and for your lovely words :) Best wishes on your studies. My daughter is also in college and will be staying on campus to study too. I do hope you have a great weekend, even with studies on the menu. They do look tasty. I should make some with some mulberries I picked. I have a whole freezer full. We're having Travis, my sister Terra, and Mica's birthday celebration. Kind of late for Mica, but on time for the others. Then we're meeting up with the family that has the boy that's about to have brain surgery. I hope all that goes smooth for him! Mulberry pops sound so good! I have a bunch of blueberries I need to use up, so I may do a combo this weekend. I'm making these for the weekend. 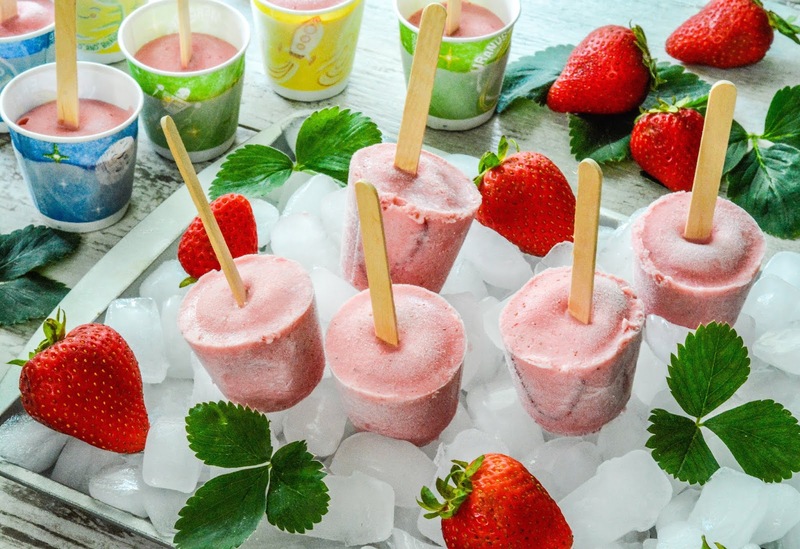 They're delicious and healthy, and they are JUST the thing to cool off during these warm months. Sure looks like it would be great help in cooling off. Sure don't have as much going on as you. I'll hobble from the bedroom to the bathroom, maybe the kitchen when time to eat lol there's my weekend. These look so good. I love anything strawberry so I know I would enjoy these. I'll be sad when strawberry season is over. I guess I need to jump on the pumpkin flavored everything bandwagon to have something to look forward to. Oh yum! I love how simple, but decadent these are! It has been so hot here lately that I can totally justify some ice pops! Oh those look so good. I've made fruit popsicles before but with a different recipe. Oh wow. I am going to make this today and give it to my mom. She loves strawberries and a freeze pop would really be something I know she'd enjoy, especially in this heat! High Five!! And to copy the kids...yaaaaassss!!! This is so perfect for this weekend because it's super easy, fast and everyone's going to love them!!! Such a lovely way to beat the heat for the remaining days of the summer. I love treats like this that's easy to make and so tasty! Good for you too! look delicious and really pretty !! !